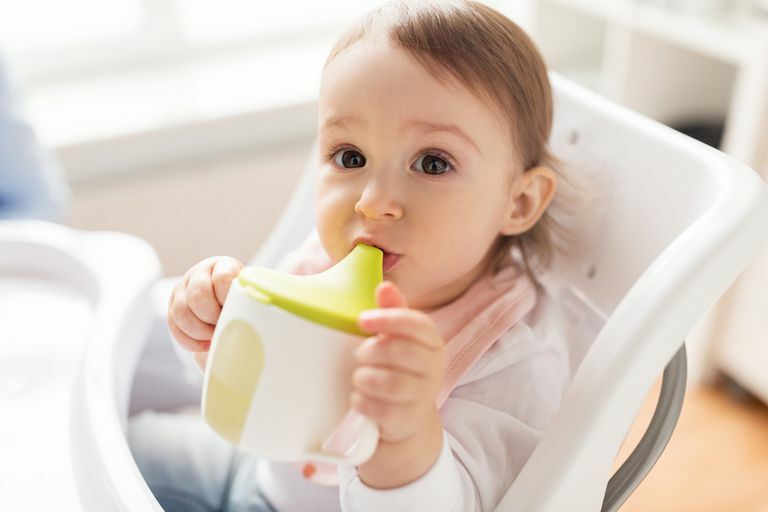 If your child uses sippy cups, especially the type designed to be spill-free, you have probably encountered the ooey-gooey gunk that can get stuck inside the small valves, straws and other parts. This can be dangerous, since bacteria and mold love spaces like this and thrive in milky or sugary environments. It's hard to use a bottle brush for small sippy cup parts, even if you have one that's equipped with the smaller brush on one end. Abschick1 found an unconventional solution to this problem: "Recently, when I went shopping for my dental floss, I saw those small brushes that people use to clean between their teeth. I decided to buy a few of them to clean out the juice stains in the 'hard to clean area.' The brush works very well. Sometimes, I will soak the cup in detergent water for a while before I actually start using the brush for detail cleaning." There are two popular types of sterilizers: plastic reusable and limited use bags. Both use the power of your microwave and steam to get rid of any harmful substances lurking in small places. If you bottle fed, you might have one of the plastic versions already, but you may have put it away when your child weaned to a cup. You can get it out again and use it just like you did for bottles, instead of filling it with sippy cup tops, valves, and straws. If you don't have the plastic version handy or you'd like something that takes up a bit less space and can travel, try the microwave bags. These are available at discount stores like Wal-Mart or Target or you can order them online. According to zmra7, "You just fill the bottoms with water, put whatever you want clean in there, and pop them in the microwave for a couple of minutes. They're really inexpensive and the bags are reusable." Firstbaby1 says, "I wash mine in the dishwasher, and if they get really gungy I just toss them." So if you've got a dishwasher, you can certainly use it. However, one thing many parents do to reduce the risk of scalding injuries is lower the water temperature on their hot water tanks. The water might be hot enough to clean your dishes, but might not always do the trick for irregular surfaces and the little nooks and crannies of sippy cup parts. If you want to give it a try, one accessory that can be a big help is the bottle basket. It snaps closed to keep parts from dropping into the bottom of the dishwasher and melting on the heating element. I breastfed, but my son did take bottles now and again. Since it wasn't all the time, I didn't feel the need to spend the money on the bottle sterilizers. Having been a fan of canning pickles using the "hot water bath" method for some time, I just followed my granny's lead and sterilized his bottles and my breast pump parts on the stove. You can do the same for sippy cup parts. Just boil a pot of water and put the parts in the water, cover and boil for five minutes. There are also stovetop bottle sterilizers available, but they're a bit pricier than the microwave versions and more of a hassle to deal with. Tresa says, "I use denture tablets to clean all our sippy cup parts. Just dissolve a few tablets in a bowl and watch them come clean before your eyes. My kids love to look at the fizz!" Dee says, "I just thought I would share a fairly inexpensive and easy way to clean sippy cup parts and straws, I use a Q-Tip. It works well and I don't feel like I'm cooking the milk in it." Sharon says, "I use a pipe cleaner. I cut one in half and use it to clean the inside of the straws that accompany sippy cups."